I don't know if I could ever have a regular, corporate job. What would I wear everyday? I honestly have no idea what to wear to work or interviews. But if I had to take a guess, it would probably end up looking something like this. Of course this outfit has many business 'faults'- a sheer top, a mini skirt and platform heels. Nonetheless I don't think workwear should be 'boring'. Add a little colour. Add a little pattern. Add a little surprise to your outfit. There's no reason why you can't look a million bucks while you're earning a million bucks (yeah, keep dreaming Izzy...). 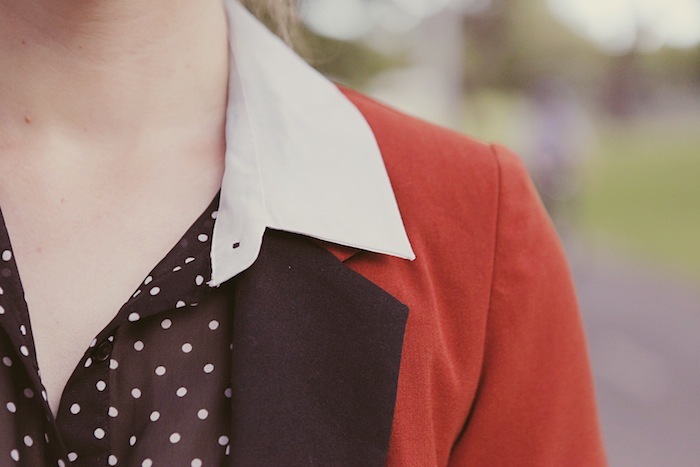 Love the polka dots with the red blazer! And I am totally with you...whenever I have to dress business casual I am at a loss. this is a seriously beautiful outfit you have great style! I am from Brisbane too!